The Grateful Dead’s annual Mardi Gras concerts at the Oakland Coliseum were legendary with epic set lists and spectacular parades filled of animatronic floats ridden by phosphorescent skeletons and people throwing candies and beads to thousand of concert-goers dressed in festive garb. 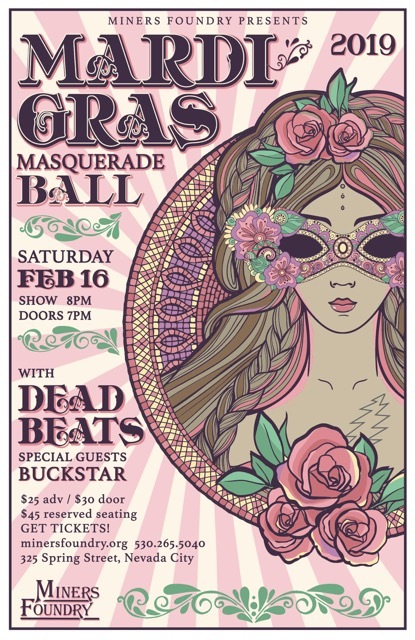 This year’s Mardi Gras Masquerade Ball harkens back to those joyous celebrations of life, community, and music, with an evening of dancing featuring the Deadbeats and BuckStar. For twenty-two years, the Deadbeats have been channeling the spirit of Dead shows to the delight of regional audiences. The Deadbeats formed during the Summer of 1994 on the notion that they could, somehow, pull off some reasonable Dead covers. After a handful of practices they decided to give it a go at Nevada City’s old Mad Dogs and Englishmen Pub. When the place filled to capacity by 10:00pm and folks had to line up outside the door they knew they were on to something. That “something” is a certain, undefinable, sound and feel that captures the essence of a Grateful Dead concert. 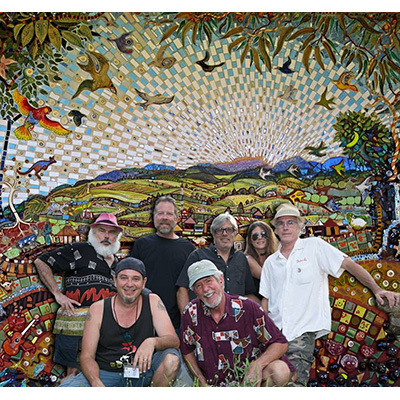 The Deadbeats continue to evolve with original members Tom Menig, Eric Menig and Gary Campus being joined by Rob Kopp, Glen Tucker, Peter Wilson, Lucas Weber and Jenn Knapp, for this Mardi Gras journey into the music of one of America’s most enduring bands. Local country rock band BuckStar opens up the evening. BuckStar crafts catchy original tunes with tones that carry from old school to new school. At the heart of their music are Alleghany native Jenn Knapp’s original songs. Knapp began writing songs following the death of a close friend. She promised to learn guitar and was soon picking out chords on a guitar inherited from her grandfather. She and drummer Rob Kopp’s band Big Picture featured their songs. That band evolved into the Cheatin’ Buzzies – a mainstay on the regional music scene for over a decade with three albums and what Knapp describes as “a pretty substantial body of work”. Much of their recording was accomplished at guitarist Tom Menig’s Silver Maple Studio with Menig contributing guitar and pedal steel to their recordings. BuckStar came to being in 2014 with their self-titled CD release in 2015. 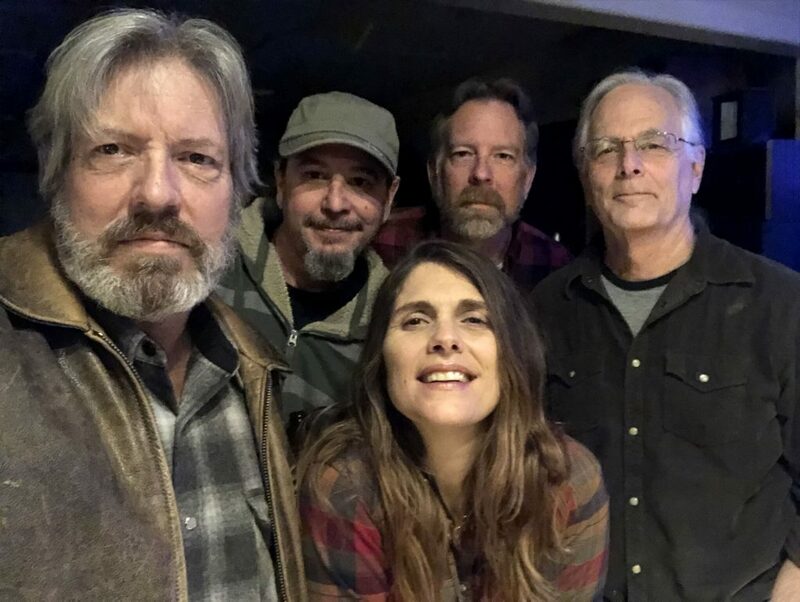 They were featured at the California WorldFest, played honky tonks from Joshua Tree to Alleghany, and are currently putting the finishing touches on their second album. Costumes and masks are encouraged! TICKETS: $25/Adv, $30/Door, this is a standing/dancing show with limited seating available. Tickets are available online at www.minersfoundry.org, by phone (530) 265-5040 or in person at the Miners Foundry, or at the door. Advance General Admission tickets are also available at BriarPatch Co-Op. Ticketing fees do not apply for purchases made by phone or in person at the Miners Foundry Box Office.